Kidderminster Harriers have signed goalkeeper Dean Snedker for the forthcoming season after a successful trial with the National League club. 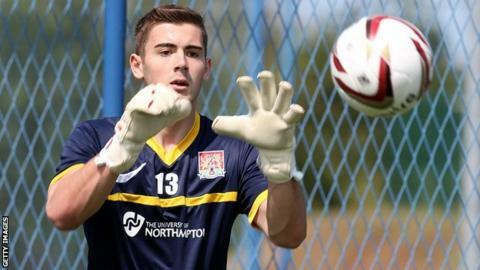 Former Northampton Town trainee Snedker, 20, was a free agent after leaving Brackley Town in the summer. "It's been a long, long summer, working hard to get my contract," said Snedker. "Pre-season has flown by. I'm happy to get it done and dusted and am looking forward to cracking on with the season and hoping we get a good start." Dean Snedker is boss Gary Whild's fifth signing of the summer, joining defenders Kelvin Langmead and Lathaniel Rowe-Turner, midfielder Joe Clarke and teenage goalkeeper Alex Palmer at Aggborough. Snedker made three appearances in three and a half years with the Cobblers, where he first worked with fellow Harriers summer signing Kelvin Langmead and Harriers coach Tim Flowers. Having spent all pre-season at Aggborough, he now becomes Harriers' fifth signing ahead of the new campaign. He will compete with Alex Palmer, who is on loan from Premier League side West Bromwich Albion, for the number one keeping spot.